Hello everyone! Today, I have a few more February New Releases from JustRite® Papercraft to share with you. Due to my schedule I wasn't able to post on all of the release days so please be sure to check out the JustRite Inspiration Blog so you don't miss any of the New Releases. Today, I have three cards to share with you. 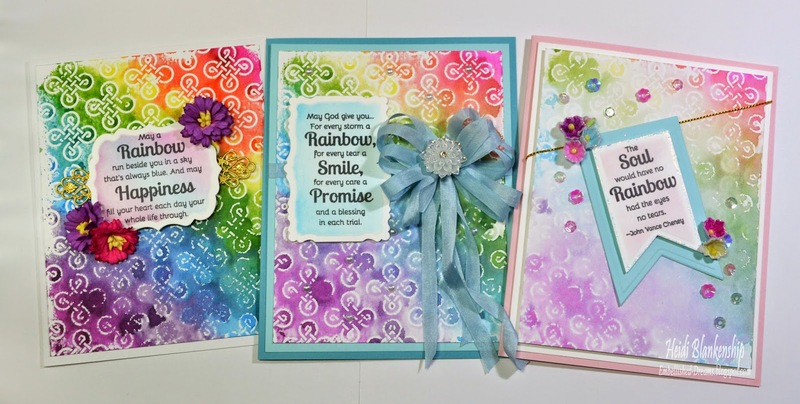 I used the same stamp sets on all three cards and the same technique but they all have a different look. Here is a quick look at all three cards. 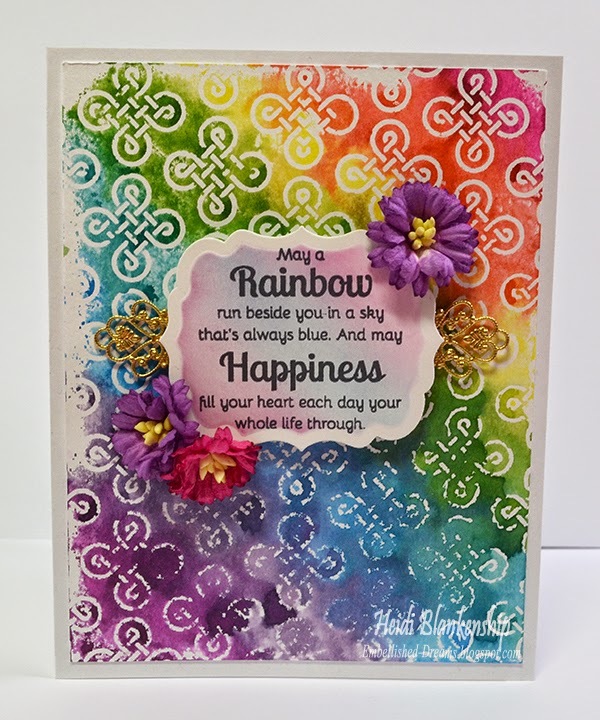 I used CL-02122 Celtic Knot Background Stamp on all three cards but I did three generations of stamping. See how the background colors get lighter with each card. 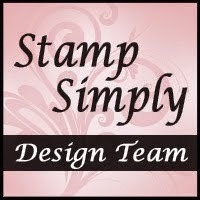 I inked the stamp one time using Tim Holtz Distress Markers (listed below). 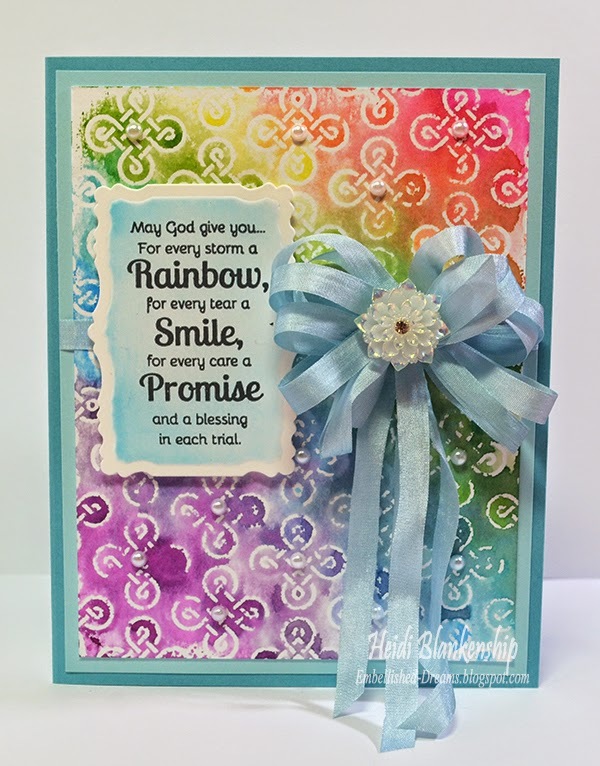 Then I misted the stamp and the watercolor paper with water and stamped the background image. Then repeat two more times. With each stamping you will get lighter color tones. Here you can see all three backgrounds. 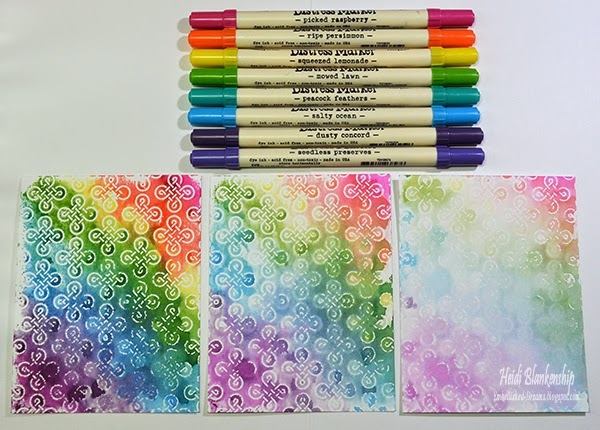 This is a very easy technique and a great way to create multiple cards but with different looks. Here is the first card. 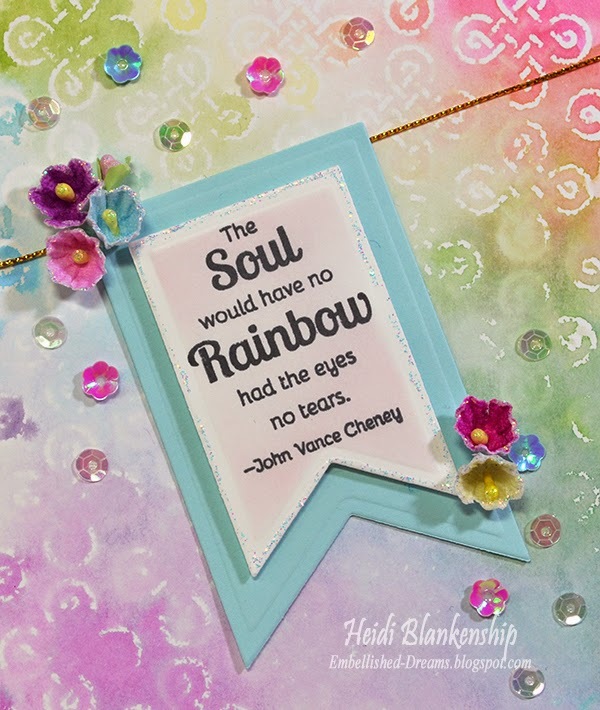 This one has the brightest and bold colors of all three cards. 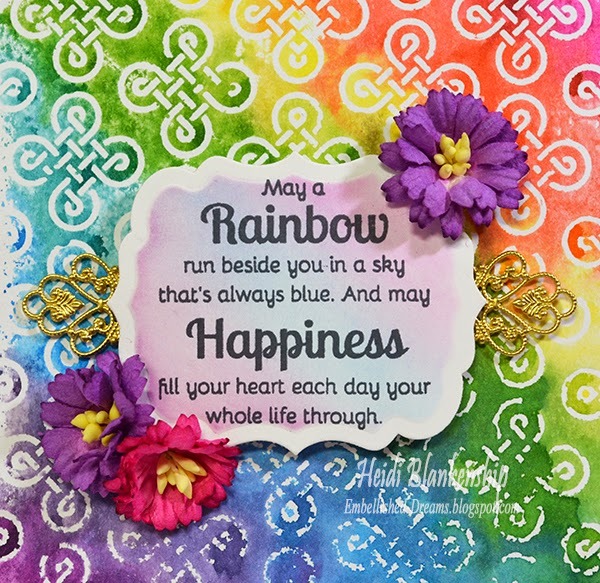 I used a sentiment from the CR-02118 Wishing You Rainbows Sentiments. To create the label I used S4-462 Labels Thirty-Nine die template. Then I added some Brass Filigree Embellishment (Item #949-G) from ButterBeeScraps on each side of the label and a few Wild Orchid Craft Flowers. Here is the second card. 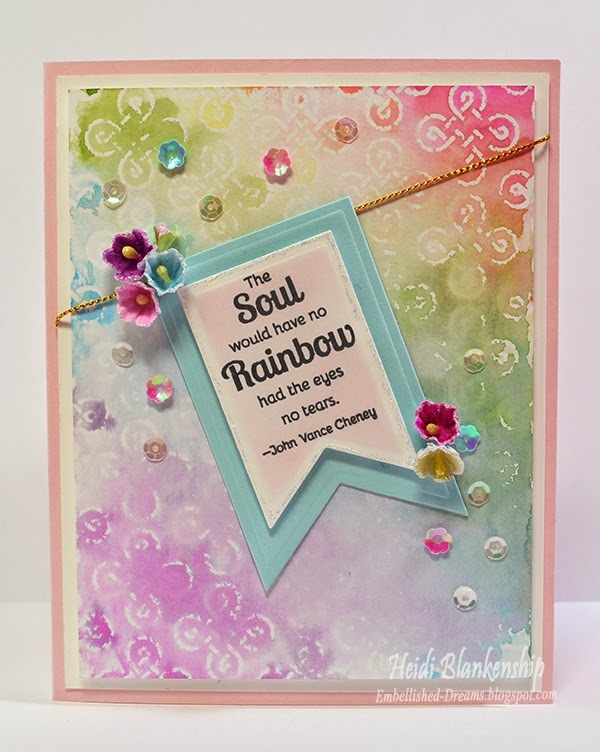 The sentiment is from CR-02118 Wishing You Rainbows Sentiments. I used S5-156 Labels Twenty-Nine to create the label shape. Then I made a bow with May Arts Light Blue Silk Ribbon and added that to the card front. To finish off the card I added a few white pearls and a AB Cabochon Flower to the center of the bow. Here is the third and final card. I just love how soft the colors are on this one. 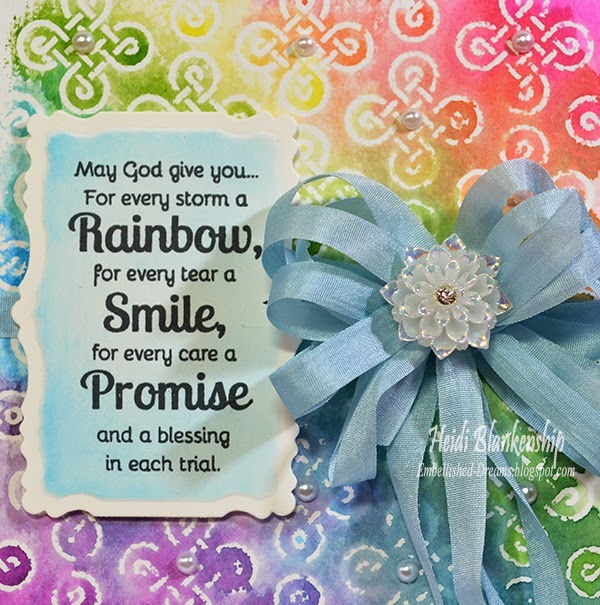 For the sentiment I used CR-02118 Wishing You Rainbows Sentiments. To create the label shapes I used GLD-016 Baby Buntings die templates. Then I layered the labels and added some Gold Metallic String to hang the labels from on the card front. I added some Wild Orchid Craft Flowers and a few different kinds of sequins. For a little more sparkle I added some diamond stickles to the flowers and around the label. I hope you enjoyed this release and the cards for today! Please be sure to check out all of the JustRite Design Team Members in the link list below to see what they have to share with you. Very pretty cards. I love the different look with each of them. TFS! Gorgeous, love the awesome sentiments.I'm a sucker for Celtic! Thank you so much for stopping by and taking the time to leave a comment!! I really appreciate it!!! Click the Button to Follow Me on Feedly! 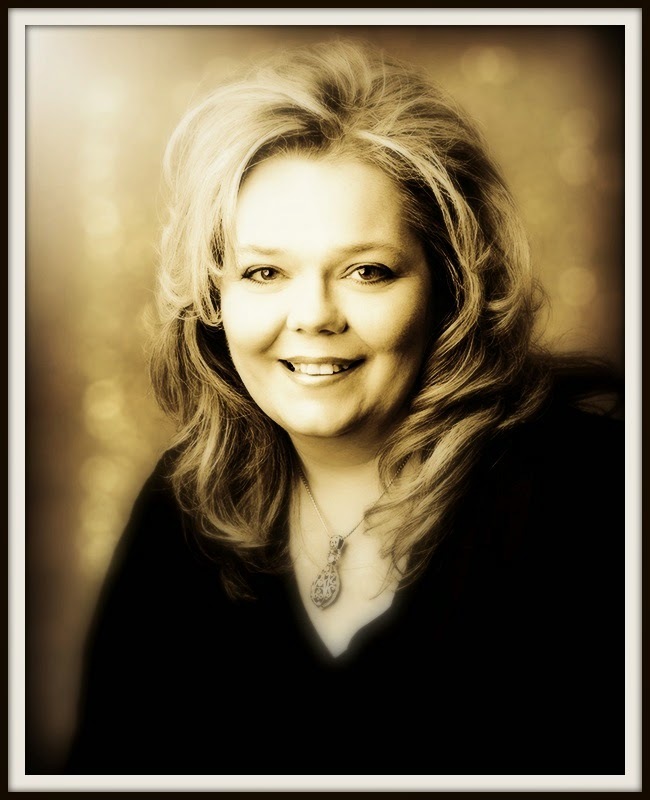 All content (including text, photographs and design work) is ©Heidi Blankenship. My original artwork is for personal inspiration only. Please do not copy for publication or submission. All rights reserved.